It’s no surprise that this most pivotal day of human history has the most details given in Scripture. Perhaps they aren’t given in the way we like things given today. There’s 4 Gospel records and the design behind which Gospel gets to tell which detail is far beyond us. In fact, the way the Lord has given us the Scriptures means that I am at no loss at all to, say, read Matthew straight through. Several facts are missing, but the great theme shines through. Still, as I study God’s Word, I may want to put those details together for my own study. Who could blame me? That day made forgiveness, salvation, and Heaven itself all possible for me. It seems as one grows as a Christian there will always be a growing, healthy fascination about Christ–what He did, Who He is, and on and on. That will entail the production of a Harmony of the Gospels. Many exist. Most are fairly standard, except for a few hard-to-pin-down places. Only those who can’t come to grips with the idea of an infallible Word might shun the whole idea. What some Harmonies fail to do is slow down at the Crucifixion. Each Gospel gives from a third to a half of its pages to that week. There is a reason for that. Then the pace slows even more for the day of the Crucifixion. My approach on the above chart is totally geared toward our culture. Midnight not only didn’t start a new day for those in Jesus’ time, but also it didn’t mean anything to them. Their day began with sundown. That’s totally unusual to we who even wait up till midnight to watch the new year come in. Jesus makes it to the Garden of Gethsemane on this day. The horrors, the betrayal, and the arrest all happen after dark and so on this new day. By the time midnight comes Jesus has already endured at least part of the 3 religious trials He faced before Jewish authorities. Peter denied 3 times and ran off weeping. It was already a hectic day before our midnight kicked in. Here our chart picks up. Dawn came pretty early then in those days of no daylight savings time. The custom of that day would be to get up early and get going, so Jesus’ civil trial before the Roman authorities all being done before 9 a.m. would not be not that remarkable. Even though we think of His suffering starting a little later, He probably has had no sleep in 24 hours (unless He caught a cat nap while being held till morning), He had a near-death experience in the Garden, and He suffered one of the most gut-wrenching betrayals ever known at the hands of Judas. Those supposedly still on His team are shivering in their sandals somewhere. Plus the trial had been a joke. One terrible false accusation after another has been hurled at Him. Finally, He is scourged with a cat-o-nine tails whip and is forced to carry His Own cross. No wonder He collapsed under the weight of the main beam of the cross. By 9 a.m. He is actually hanging from that cross facing one of the most gruesome execution methods ever devised. Here’s where a synthesis of the Gospel records proves handy. So much happened. There were 3 hours of light and interaction with those around Him including much ridicule. He, as you surely know, never wavers. The three statements He makes during this time prove that pain and suffering couldn’t squeeze His great love out of Him. At Noon a darkness overtakes all around. It was a darkness you could almost feel. You can sense an edginess by many. The suffering intensifies as every moment brings Him closer to death. What might not be obvious in any one Gospel record is that He gives His last 4 statements near the end. These all have to do with the agony of the sin He bears for us. “It is finished” is profound in its meaning, and exhaustive in its scope. All that could ever be required for my sin is given here. At 3 p.m. He dies. More accurately, we say He laid down his life as He chose the time and the place. No person in Jerusalem that day could ever forget what it was like at 3 p.m. that day! Others things happen, as you can see on the chart, but are rarely discussed as what happened at 3 p.m. eclipses all. Can you imagine how those women felt who left at dark after watching the stone being fully in place at His tomb? Remember for them it ended the Day of the Crucifixion. For us it might as well have even though midnight was roughly 6 hours away. Put a marker in your mind for that ending day as it set in motion a 3-day period that at its end will melt all the gloom there away forever. 1. How do our customs affect how we view the story of the Crucifixion? 2. 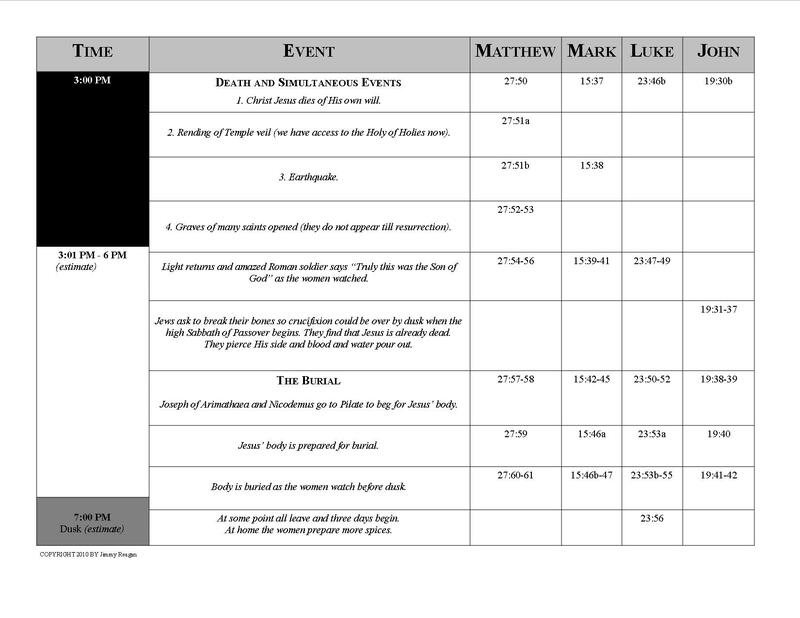 What is the difference in how the 4 Gospels present the story to how we looked at it in our chart? 3. What are your thoughts on the scope of Christ’s suffering? 4. Describe your thoughts on the few minutes before and after His actual death. 5. 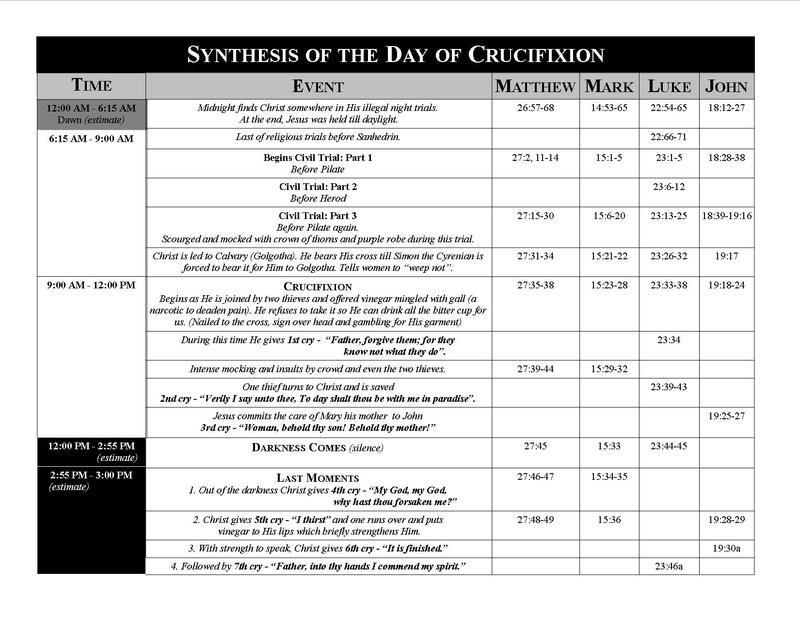 Compare and contrast the Day of the Crucifixion and the Day of the Resurrection. 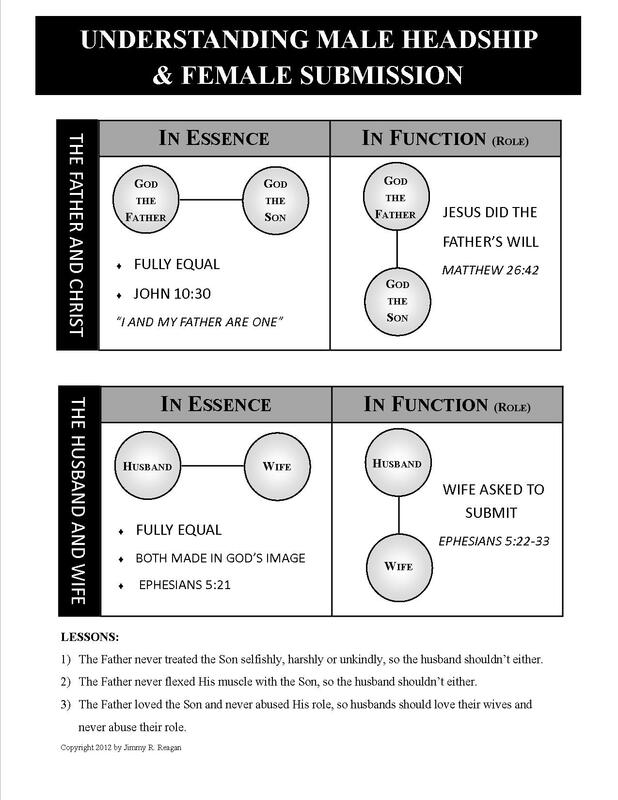 After the great response to my wife’s powerful blog post Dear Wives, we thought it might be helpful to approach the subject with a Biblical study showing the theological implications. I believe her position follows the Word of God. This isn’t a “how to be a good husband” blog post. I’ve got too much to learn there myself. It is helpful, however, to understand the legitimate boundaries of what it means to be a good husband Biblically, or I won’t even know where to start in trying to be the right kind of husband. Plus the ladies need to see what the Bible really asks of them amid the conflicting reports they hear. We tweak our role of headship until it means boss and master. We quote some verses to the exclusion of others and spend a great deal of time explaining how the ladies must obey while speaking little of our command to love. You know, that “love” thing is touchy-feely and hard to quantify and so not worth discussing. Scholars battle the same battles in a way. Like the population at large they divide into 2 camps and give them high-sounding names. One group says men and women are equal and nothing else matters and so call themselves egalitarians. The other group says men and women are equal but have God-given roles that ask different things of them while never doing away with equality. They call themselves complementarians. This group takes the Bible more literally and is generally more conservative. I believe this to be the Biblical position. Within the conservative world, though, there’s another group that wields too much influence and are unnoticed by the scholars. I think I’ll name them the Authoritarians. They believe in God-given roles, but do not really believe that men and women are equal. The idea of women being the “weaker vessel” extends beyond the physical to spiritual, emotional, and intellectual levels to their minds. Unkind, unchristian, and even abusive behavior springs out of this thinking. To my mind, this in no way could be supported Biblically. So how are husbands and wives to live this unique thing that the Bible asks. We actually do have a blueprint. It is in the relationship that the Father had with Jesus while He was on this earth. Clearly, there is unity in the Godhead. We often say the Godhead is co-equal and co-eternal. Still, when Jesus came to this earth He had a very distinct role to fill–to be our Savior. In this role, He was always saying He was doing the Father’s will. He found a way to do this without surrendering His equality. On the other hand, the Father treated the Son with such love and respect. Remember how at Jesus’ baptism the Father burst out with: “This is my beloved Son, in whom I am well pleased”? Perhaps you think you have found a flaw with this already. Perhaps, gentlemen, you say that your wife isn’t perfect like Jesus. I still think it fits because we fellas aren’t perfect like the Father either! They are equal in their perfectness while we and our wives are equal in our imperfectness. If that be true, this will take work of course. Still, certain things are out of bounds. Would you ever imagine the Father yelling at Jesus? Or belittling Him? Or trying to put Him in His place so He’d know Who the boss is? Or using Him for selfish ends? Or think of this–Could you ever imagine the Father asking for submission without providing complete, unselfish, and unconditional love? I didn’t think so. Gentlemen, the boundaries are not where we have always felt or been told they are, are they? I’ll say this–I’ve grown to this position over time. I still have a long way to go, but this realization has transformed our marriage. When the wave of the tsunami flows back to sea you are left with destruction. If you walk through the muck and look closely you can start to understand the ruinous conditions wrecked upon the landscape. I’ve looked. Two days ago I wrote The Tsunami of Jack Schaap and I can’t believe what I see. This post has nothing to do with Mr. Schaap per se, but what is going on in Independent Baptist churches. Two hideous things jump out. First, people who love the Lord and desperately want to do right are at a complete loss with how to handle an abusive pastor. My wife and I have received calls and emails asking, “what can we do?” The answers aren’t easy. As a pastor, I know you don’t want to make petty criticism fashionable. You know the type–that’s the wrong color of paint, that’s a stupid song to sing, that’s an inferior way to illustrate that point, or even it’s criminal to have a service at 6 p.m. instead of 7 p.m. We pastors can take a little abuse too! But pastors becoming enraged, engaging in verbal battles, and threatening their church members is epidemic. Of course there are many wonderful pastors serving selflessly. I know some of them. On the other hand, we’ve heard stories of chest bumping, yelling, and threatening to have you shunned. I am well aware of troublemakers, but I am referring to people who are torn because they fear hurting the church and hurting others while knowing that type of pastoral behavior is unreasonable and unchristian. It should be dealt with, but how? I’m still thinking it through, how to balance pettiness and real issues. I imagine the answer lies in the Biblical qualifications of a pastor (1 Timothy 3). Things like “brawling” are sufficient to opening the discussion of a man being disqualified to pastor. As it is now, it seems “husband of one wife” is the only one that counts. The Bible, however, makes no such distinction. If a real qualification is breached, it must be dealt with. If it’s something less than a stated Biblical qualification, let it go. Lord, give us wisdom. The other rotten thing that I see is the treatment some wives, particularly pastor’s wives, are enduring. Tyrants at church are likely ruthless at home. There are reasons some of these wives so rarely smile. The keep the stiff upper lip as they have been told they will be guilty of destroying the husband’s ministry and shaming the family. It’s manipulative and dishonest, but some ladies are rather selfless and take it for the others. Even when the scandal breaks out, some have the audacity of blaming them! (BTW, anyone who blames Cindy Schaap in the current scandal is far out of bounds). Even if you, as I, think highly of the office of the pastor, we must honor it further. We must not sully its call, nor corrupt its beauty. We must hold it accountable to protect its great honor. And may God help us. (My wife, Alicia, has written something to help the ladies in light of the response these blog posts have had. I encourage you to read what she has to say. Alicia’s blog post). You’ve probably heard the news by now. It’s hard to grasp how big this is in the Independent Baptist world. I assure you I’m no rabble rouser, but this demands reflection. I sense a tsunami running through our ranks, bowling things over and destroying as it goes. Many of the thoughts I’m hearing, however, miss the whole point. First, I take no pleasure in another man’s fall. Some out there are not doing as well as they imagine in hiding both their glee and the fact that it’s all a political game to them. You know the type–I stand taller when my enemy falls down. I know we are told it is doctrinal issues, but I haven’t been convinced it is so. I know Mr. Schaap has literally wrecked his life. I always pity that sort of thing. I know there is an innocent wife who has been shamed beyond what any lady should endure. I know there is an ashamed congregation that is feeling all kinds of pain. I also know there are many pastors and college graduates who are horrified to answer for something they are in no way responsible for. Finally, and this is the worst, there are many who looked up to Mr. Schaap to such a degree, who hung on his every word, who followed his counsel, who are now struggling with the idea of walking out the church door never to return. Of course, we can wax eloquent about how they should never have looked up to a mere man to such a degree in the first place, and of course we’d be right, but it won’t change the fact that they did and that they stand bewildered today. I do not, nor have I ever, counted Mr. Schaap an enemy. I have no desire to pile on, but we must call a spade a spade. What he did is egregious sin. That the girl was young enough to be his granddaughter makes it abusive and more perverse. Worst of all, he took the highest calling, a call to be a pastor of God’s people, and abused it. Having labeled it the sin that it is, I pray he is restored as a Christian man in the spirit of Galatians 6:1. I pray someone is ministering to him. I do believe we need to feel something of “there but for the grace of God go I”. I pray for Mrs. Schaap and her family for healing. I pray for First Baptist Church of Hammond because a church crashing hurts us all. I pray for those who are feeling carried out to sea on the wave of this tsunami and can’t quite get their hands around what to think. I pray that they can see that Jesus Christ stands as tall as ever. Let’s get this straight–we can’t change it. It’s been in the news and that can’t be erased. We must be on record as being on God’s side and make no excuses or cover up for such a grotesque thing. People are hurt and there’s no magic wand to take it all away. We must love and encourage and lift up those hurting and struggling as the Lord gives us opportunity. This is no time to have a marketing campaign to convince the world how great we independent Baptists are (though we can’t help but say if there was ever a group where all are not alike, it is us!). No, let’s just humble ourselves, go on, and be as Christlike as possible. 1. We pastors must have accountability. I know we are told that “the Holy Ghost hath made you overseers” (Acts 20:28) and that we are to take the “oversight thereof” (1 Pet. 5:2). We do have a leadership role in the local church, but what New Testament example could you honestly cite that allows us to scold, yell, or manipulate? In fact, that same 1 Peter passage tells us that our ministering and leading not be that way, “neither as lords over God’s heritage, but being an ensamples to the flock.” Please don’t imagine that it’s fine to degrade in the pulpit either. It’s the coward’s way to attack an individual under the cover of God’s sacred desk. We must be ethical and our leadership is open to honest scrutiny in the church. We should have honesty, integrity, and be fully above reproach in all we do. 2. We pastors must extend that accountability to our personal lives. When scandals like this come to light it tells me that the fallen pastor was able to go around with no one knowing where he was. It’s clear the wife wasn’t allowed to know either. Gentlemen, that is an abuse of our husband role. My wife always knows generally where I am and who I am with. She knows every password for my email, facebook, or any internet thing I do and can check it any time she likes. She can pick up my cell phone and look at any history she likes. In fact, if she picked up my phone in front of me, it wouldn’t even cross my mind to be concerned. She has full access to all bank or credit card information. There’s no way I could wine and dine another lady unless that woman paid for the whole thing! Plus, I’d still have to account for my time! It’s not that my wife even demands all of this, but I know accountability is a good thing. 3. We pastors must maintain a sense of decorum and purity in all we do. There’s a crudeness that is being accepted that is fully unacceptable. This is the age of shock value but we surely realize that we don’t have to take up all the habits of the age we live in. There are details of sin that don’t inspire us away from that sin. In fact, those details do the opposite. They fascinate us and lead our thoughts down dusty, dirty paths. A pastor trying to outdo the shocking statement he made last sermon not only puts himself under enormous stress, but also pushes himself to the edge of places dangerous to be. No wonder that circles that start doing this more find themselves in a rash of scandals. The pureness of God’s Word is greater than the filth of the world. That is doubly true in preaching. 4. We pastors must cultivate our own marriages. The Lord knew we men would need a lady in our lives. And yes, the sexual side is part of it. I encourage us all to look again at that beautiful lady we already have. Focus on her. Love her, romance her, enjoy her, immerse her in all areas of your life. You might find that you can have all the thrills you could ever want with the lady you already have. Look deeply into her eyes, really kiss her, praise God for her, and enjoy a wonderful part of life the way it was intended, and for the record, without sin. 5. We pastors must put the sheep first. It’s time that every independent Baptist pastor quit imagining that his every thought is superior to those of the flock. The people I pastor (be careful here, read slowly, this may be a great shock to many of my fellow pastors) might know more than me about which house or car to buy, or who to date or marry, etc. A good pastor will show you when something is clearly a sin, but he lets you run your own life. You know what we have done? We are robbing those we pastor of something Baptists historically have died for–soul liberty. Instead of shepherding them into becoming stronger Christians, we stunt their growth by taking away that which is vital to becoming a stronger Christian–the ability to seek God’s face yourself. 6. We pastors must quit riding hobby horses. Some like to ride some subjects to death. If you preach in great detail more than twice a year on adultery, you are a little over the top. If a preacher man preaches on women and their dress, etc., particularly with emphasis on body parts, all the time, then he is obsessed. We know where his thoughts are most of the time! People everywhere are starting to figure out that when you work things like that into every sermon it is likely because you are struggling personally in that area. Before you get angry remember that a day before a fallen pastor gets caught he likely would have ripped your head off for saying this. A word to the wise–make Jesus your hobby horse and that will never shame you. Emphasize the Gospel and you will never have any backlash. Could I put a little plug in for expository preaching here? 7.We pastors must remember Who we serve. Pastors face peer pressure just like anyone else. We want to be loved by the group we run closest to as much as anyone else. We must, however, live by principle. We must have an allegiance to God’s Word, not what our clique says is God’s Word. We must get to where we only need His smile upon us and then we will be free. Free to be the pastor the Lord asks us to be. The tsunami has rolled through. Destruction is all around us. Let’s rebuild with Christ’s aid something stronger than we had before.